As the Smurfs get ready for the Blue Moon Festival, Papa Smurf sees in his cauldron a vision of Clumsy Smurf reaching for a dragon wand and the Smurfs in cages while Gargamel laughs. Not wanting this vision to come true, Papa Smurf refuses to allow Clumsy to pick Smurf Roots, but Clumsy disobeys Papa Smurf and ends up unintentionally leading Gargamel and Azrael to the village. The Smurfs all flee for their lives while Clumsy unknowingly runs towards the Forbidden Falls, with Papa Smurf, Smurfette, Grouchy, Brainy and Gutsy running after him. They find him at the edge of a cliff, and while trying to help him up, they are sucked into a gigantic vortex that spirits them to present day New York City. To make matters worse, Gargamel and Azrael follow and the Smurfs end up in the apartment of Patrick and Grace Winslow, a married and expectant couple and their Basset Hound Elway. After clarifying things, the Winslows befriend them and allow them to stay in their apartment. The next day, needing to find a "star gazer" (a telescope), the Smurfs follow Patrick to his work place at Anjelou Cosmetics, misunderstanding the previous explanation of his job as fortune-telling. He calls Grace to pick them up. However, having extracted "Smurf essence" from a lock of Smurfette's hair, Gargamel also arrives and ends up being treated by Patrick's boss Odile upon using most of his acquired magic to turn her mother young. But Gargamel resumes his search upon recognizing Patrick and following him to the toy store where the Smurfs ran into after finding a telescope. The Winslows manage to save the Smurfs from both the children wanting them and Gargamel, who ends up being sent to jail before he manages to bust out with the aid of house flies. By that time, Papa Smurf manages to calculate the night he and the others can get home. But first, he must figure out the spell to do so. Patrick tells them that there is an old book store in the city near Anjelou Cosmetics as he bonds with the Smurfs after sending what he believed to be his finished advertisement to be published. However, the next day, Patrick learns that Clumsy accidentally attached a blue-moon themed side project and he loses his temper before walking out on both the Smurfs and Grace to save his job. Forced to search on their own, the Smurfs find the store and find the book L’Histoire des Schtroumpfs by researcher Peyo, containing the spell to turn the moon blue. But learning of their location, Gargamel sneaks into the book store and finds a dragon wand, transferring his magic into it as he uses it to capture Papa Smurf as he sends the others to safety. Though the Smurfs promised Papa Smurf that they won't try to save him and return home, Clumsy and Patrick, having seen the error of his actions, convince them to plan a rescue. 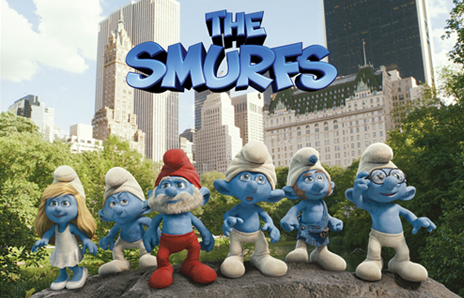 At Belvedere Castle, after increasing the dragon wand's power with bits of Papa Smurf's beard, Gargamel finds himself facing all the Smurfs, summoned to New York by Brainy conjuring the blue moon. As the Smurf army battles Gargamel, Smurfette fights Azrael and saves Papa Smurf before they join the fray. Though Gargamel attempts to break the Smurfs by killing Papa, Patrick saves him while Gutsy knocks the dragon wand out of the wizard's hand but he drops it. Clumsy tries to catch it, and to Papa Smurf's surprise, manages to catch it and sends Gargamel flying into a trash can and being hit by a bus with the advertisement "Blue Moon" with it before Papa Smurf breaks it. Soon after, the Smurfs take their leave as Patrick receives a call from Odile that he still has his job. Later, Patrick and Grace have a baby boy, whom they name Blue to honor the Smurfs, who rebuild their village in the style of New York, where the Winslows reside. Gargamel still trapped in the future and seem to have another wand as he strike the screen with a magical bolt.